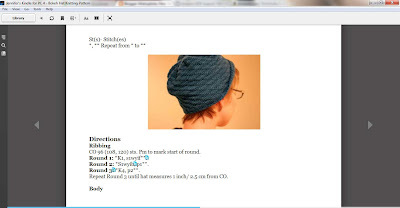 Using the kindle app is much like reading a PDF version of a pattern on your computer- but with the added bonus that it is easy to add notes to yourself! Download the kindle app for your computer on the App page of Amazon . Highlight. For directions I am only working once, I highlight them to show I have completed the directions. To highlight, right click and select highlight, or click and drag before clicking highlight to highlight a section. For repeats, I make faux hatch marks by typing in "1" as a note. This works well either every row or every repeat. If I do it for every repeat I add to the note which row I stopped on mid repeat. Charts- it is easiest to just use a sticky note on my screen. I know, I know, cheating. But hey, it works for me. Since I can't note on the chart what row I stopped on easily (since it is an image), I make a note nearby. PPS- highlighting and using notes to mark rows works just as well on a Kindle. I am just losing my voice to much thanks to a nasty cold to make another video!